Home Affairs Department attended public consultation on 2019-2020 Migration Program of Australia. 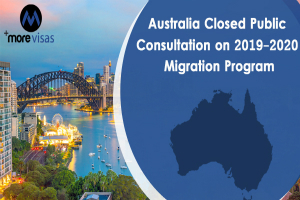 The goal of the discussion paper is to explore stakeholder and public views on the present immigration program of Australia to assure that immigration remains to serve the country interest and the concerns of all Australians in the upcoming year. The composition, rate, and immigration distribution has a notable impact on Australia's present population and the population distribution (particularly regional areas of Australia). Immigration programs of Australia are continuously evaluated to assure that settings maximize the advantages migration brings to Australia. Skill stream – enhances the productive capacity of the Australian economy and fills skill deficits in the labor market, along with those in the Australian regional area. Family stream – enables citizens and permanent residents of Australia to rejoin with nearby family members, along with partners, and specific dependent relatives. Special Eligibility stream - grants visas for those in exceptional situations that do not fit into different streams, including past residents. The stream of Special Eligibility is a minimal component of the whole permanent Migration Program. At present planning levels, the Australian government expects to allocate nearly 190,000 positions to permanent residency. The Australian government dropped short of the goal of the last year granting roughly 165 000 permanent residency visas. Skill – This describes most positions offered (128,550 positions in the year 2018-19). Family – 57,400 positions in the year 2018-19. Special Eligibility – 565 positions in the year 2018-19. Since 2015, the preparation level has been managed as a ceiling rather than an aim. This assures that measures are not reduced to satisfy an overall number.